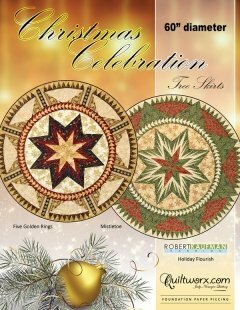 The Christmas Celebration Tree Skirt is a Quiltworx.com best seller that has been made around the world and in many cases, by our fans more than once! To freshen up the pattern and update it for more current fabric lines, Quiltworx.com worked with Robert Kaufman and the Holiday Flourish fabric line to create new color layouts! Directions have been updated to provide yardage information that is generic in nature (can be used with any pattern), and graphics have been updated to reflect current pattern publications, including more detailed cutting and stacking information. The newsprint papers have not changed.